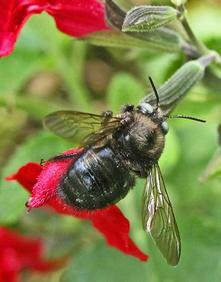 Carpenter bees are large - three-fourths to one-inch long - and robust. They are colored black with a metallic sheen. The thorax is covered with bright yellow, orange, or white hairs, and the upper side of the abdomen is black, glossy, and bare. The female has a black head, and the male has white markings on the head. Carpenter bees have a dense brush of hairs on the hind legs and somewhat resemble bumble bees, except bumble bees have dense yellow hairs on the abdomen and large pollen baskets on the hind legs. Various species of bumble bees and carpenter bees are similar in size, bumble bees typically nest in the ground whereas carpenter bees nest in wood. Carpenter bees are solitary insects that do not form colonies. They overwinter, wait out the winter season, within their old nest gallery and emerge in the spring (April and early May) to mate leading to one generation a year. When constructing a new nest, the female uses her strong jaws, mandibles, to excavate a clean-cut, round nest entrance hole on the lateral surface of wood. This hole is slightly less than 1/2-inch wide, approximately the diameter of her body. She bores into the wood perpendicular to the grain for one to two inches then makes about a 90° right turn and excavates along the wood grain - about one inch every six days - for four to six inches to create a tunnel also called a gallery. When they make these galleries, they also produce coarse sawdust from their borings and the gallery system is completely confined within the wood. The female bee creates a series of provisioned brood cells in the excavated gallery consisting of a mixture of pollen and regurgitated nectar formed into a ball. The female forms a food ball at the far end of an excavated gallery, lays an egg on top of the mass, and then walls off the brood cell with a plug of chewed wood pulp. She often creates six to ten partitioned brood cells in a linear row in one gallery and dies soon thereafter. Larvae feed on the pollen/nectar food mass, which is sufficient for them to develop to the adult stage. The new adults hibernate in galleries and emerge the following spring. Carpenter bees attack structural timbers and other wood products, including fence posts, utility poles, firewood, arbors, and lawn furniture. In buildings, carpenter bees nest in bare wood near roof eaves and gables, fascia boards, porch ceilings, decks, railings, siding, shingles, shutters, and other weathered wood. These bees avoid wood that is well painted or covered with bark. The carpenter bee entrance hole in wood may not necessarily be in an exposed area. For example, the inner lip of fascia boards is a common site of attack. Nail holes, exposed saw cuts, and unpainted wood are attractive sites for the bees to start their excavations. Despite their beneficial aspect of being important pollinators of many trees and flowers, carpenter bees may be nuisance pests around structures. Also, carpenter bees are noisy and alarm people when they dive-bomb or fly around erratically. This may lead many to believe that carpenter bees are dangerous attackers, however, male bees are territorial but harmless because they do not have a stinger. Only females have a stinger, but they are docile and only sting if handled. Initially damage to wood is minor, and carpenter bees seldom cause consequential structural damage. However, their repeated colonization of the same wood can eventually cause considerable wood damage. Usually these bees prefer to refurbish and enlarge an existing tunnel instead of boring a new one, and one single gallery can extend for 10 feet if used by many carpenter bees over a period of time. Sometimes, they construct new tunnels near old ones, with infestations persisting for several years and this complex system of tunnels can result in extensive damage to wood. Wood replacement is necessary when the strength of structural members, posts, poles, and other wood products is reduced due to carpenter bee damage. Carpenter bees also may be indirectly responsible for unsightly wood damage when woodpeckers riddle the wood with holes searching for the developing carpenter bees to feed upon. Keep all exposed wood surfaces well painted with a polyurethane or oil-base paint to deter attack by carpenter bees. Periodically inspect painted surfaces, because the coatings will begin to deteriorate due to weathering, leaving exposed wood that the bees then can easily attack. Wood stains will not prevent damage. Consider using aluminum, asbestos, asphalt, vinyl siding, and similar non-wood materials that are not damaged by carpenter bees. Seal existing gallery entrance holes to discourage carpenter bees that are looking for potential nesting sites.